This pea eggplant is popular in Thai cooking. 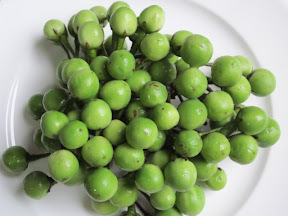 You will see them in Thai Curries or in the Spicy fry meat with Chili or in Chili Sauce and Shrimp paste. Many European mistake them for the pea because of how they are cooked, and they appear very similar to peas, but I don’t think they are favored as much as the peas among Europeans. The name pea eggplant comes from the similarity of the look, but they are from totally different kind of plant. Pea Eggplant is from a medium height thorny bush, which could live for several years. They bear white small flowers in a bunch that’s why this eggplant will come as a bunch. In term of mineral content, they are very healthy plant for they are high in Fibers, contain iron, and also help to reduce Cholesterol.